rainforest365 is available from the Apple App Store as a free download. Scan the QR code on the scanner with your iPhone or iPad and download the app. As a Web App rainforest365 is supported on any smartphone or tablet with a QR reader and a browser. Any rainforest365 compatible Contex scanner can send documents directly to your preferred destinations. rainforest365 does not require a PC. Instead it simply utilizes your smart phone or tablet to control the process. Load the document, scan the QR code, and send the document directly to your desired destination. Your rainforest365 enabled Contex scanner is the first wide format scanner that truly works for you. The only choice you have to make, is where you need the documents - rainforest365 handles the rest. 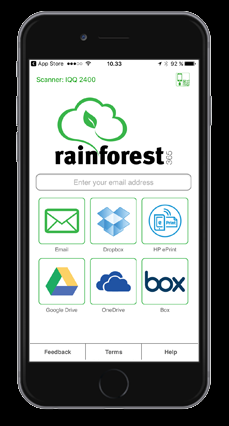 rainforest365 can deliver images by e-mail, directly into your DropBox and print to any of your HP ePrint enabled printers. rainforest365 includes a new pending patent that ensures a secure method for QR codes and Web Interfaces. 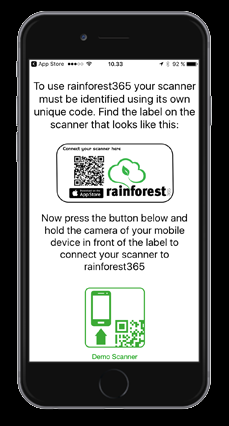 rainforest365 will only allow you to scan if you are in front of the scanner. 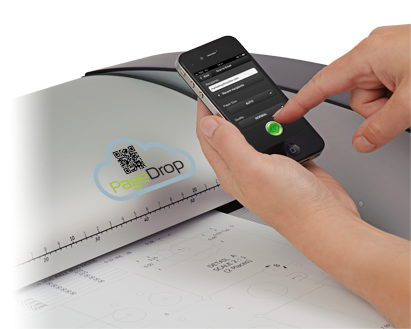 Scanning with your iOS Device is easy ! download the free rainforest365 iOS App. Use the green button to scan the QR code on your scanner to connect your iOS to the scanner. rainforest365 is now ready for use. Enter your email address and select your desired destination. Once a scan is completed an e-mail notification will be sent to your inbox to let you know your document is ready for use! 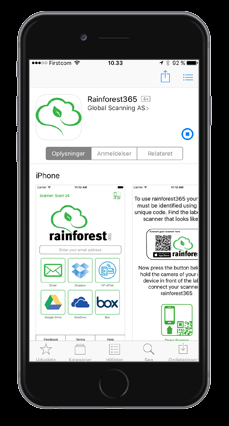 Makes every rainforest365 enabled scanner your personal scanner. Secure transfer through Contex rainforest365 Servers. Contex rainforest365 Cloud server controls the entire process. The scanned image is moved from the scanner through our Cloud server and directly to your destination. You smartphone or tablet is only used to interface with the rainforest365 service and specify the destination.Image data is transferred directly from the scanner to the rainforest365 cloud service. rainforest365 can be enabled as part of the WIDEsystem installation wizard. You can also enables rainforest365 on the Network tab in WIDEsystem. rainforest365 requires the scanner to have a active internet access. Once rainforest365 is enabled in WIDEsystem no additional setup will be required. rainforest365 always delivered industry standard 24 bit color PDF files.